" Glass " will be given by Glass Engraver - Elmer Huels of Lindley . Elmer has some interesting stories and facts to relate about the glass business. Make a note on your calendars to attend this interesting program. The March meeting was well attended last evening-(March 26 th,2009). DurlandWeale took the audience on a tour of the Lindley area in the 1930's from Morgan Creek and Rt.15 intersection down Morgan Creek Road to the area north and south of the Lindley bridge . He kept the audience entertained for an hour with stories about the people, places and events of the days in his youth. His memory of this time period was amazing and the hour passed too quickly. Durland has been invited to come back and tell more about Lindley in the 1930's. 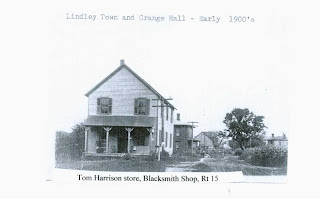 The Lindley-Presho Historical Society will meet at 7 P.M. Thursday March 26th at the Lindley Town Hall on Rt.15 . Lindley native Durand Weale of Addison will share his memories of Growing up in Lindley in the 1930's. The public is invited to attend and maybe add to the stories of this time period. Does anyone have information on S.E. Hartman who took photos for Lindley postcards about 1910? 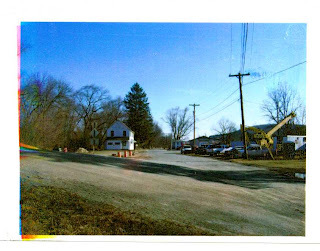 One shows the Orr Store and "old"Town Hall -Morgan Creek Road and"old Rt.15 ". Another is an iron bridge on what we think is Tannery(Cook's) Creek. Postmarks are 1910. As Town Historian trying to collect almost 200 years to history for the town files, you need to be able to fit pieces of a puzzle together and to be able to find clues as in a mystery. Such is the case of this picture taken about 1912 at the corner of Morgan Creek Road and Lindley Road (old U.S. Rt.15). A newspaper clippings of January 4th, 1912 stated the following: “ A.W. Orr the general merchant has sold his residence and store to Lettie C. Wagner and Miss Pearl Dillon possession to be given April 1st. Charles Harrison has sold his store property to the same parties, possession Jan.15th. The new firm will run under the name of Wagner and Dillon. H.R. Wagner will head the firm. Lettie C. Wagner, Miss Pearl Dillon and F.G. Wagner will be the other members. They will take possession of the Harrison store about January 15th.